It's been awhile since I've posted an outfit pic and I actually remembered to have my daughter capture me in this on Monday. I made a promise to myself that I would wear more dresses this spring and so far I've done a pretty good job of keeping it. I've bought a few, including this one that was perfect for Cindo de Mayo and for the hot and humid months coming our way. The round neck, cap sleeves and embroidery was flattering for this type of dress and it was love at first sight. Man, this week turned out to be a good one. We celebrated Cindo de Mayo with a surprise visit from one of our out of town friends and were fortunate enough to catch up again for bubbles and wine before he left town. I'm excited about celebrating Mother's Day this weekend and looking forward to seeing what next week brings. This is such a pretty dress! Have a good weekend! You look adorable as always. I love a breezy dress for the summer. Have a happy Mother's Day! Love that dress, it looks great! 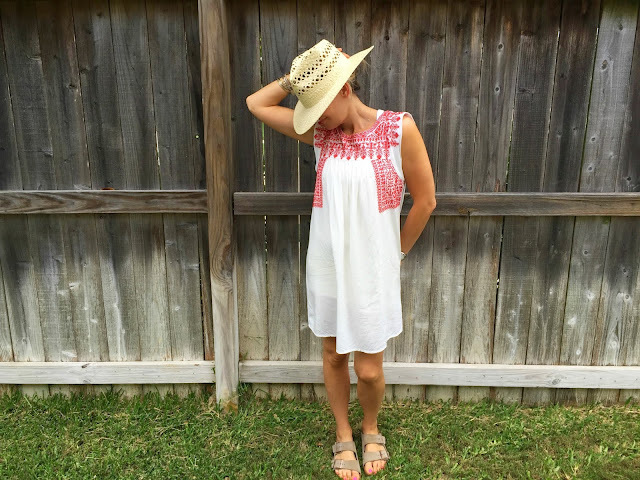 Love this dress and agree that dresses are more comfy for warmer temps. Glad you had a great week. Cheers!